The data as we see them are rather straightforward, and perhaps already have their stories to tell, albeit unsurprising ones. You’re not astonished by Harry Potter having imperialized six of the top eight positions; and neither are you thunderstruck by E. L. James’ latter-day incursion into the list (I count 150 shades so far, but check my math). Still we could do well to ask more of the data. I am reminded of the theme sounded by devotees of digital humanities (I am thinking of Stanley Fish’s Times Opinionator piece posted earlier this year), to the effect that if you spin the data through sufficient permutations something interesting is bound to emerge sooner or later; and while that premise recalls the monkey-in-front-of-the-typewriter secretarial pool, there’s probably something to the notion. So what sort of permutations are available here for the spinning? 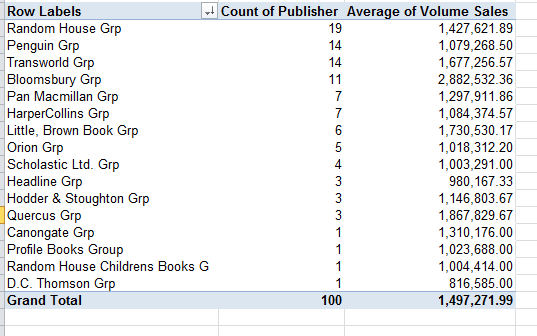 We see Random House tops the hierarchy with 19 titles (that in addition to the solitary Childrens Books entry under another imprint), followed by Penguin, Transworld and Bloomsbury in their respective silver and bronze positions. Yet Bloomsbury – owner of the Harry Potter franchise – rules the volume parameter. 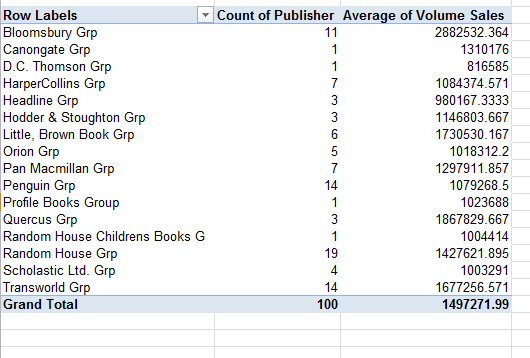 Note Bloomsbury’s superior average sales-per-title, additional evidence of the Potter effect. 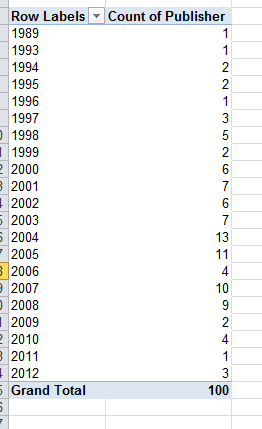 Now how about list appearance by year of publication? 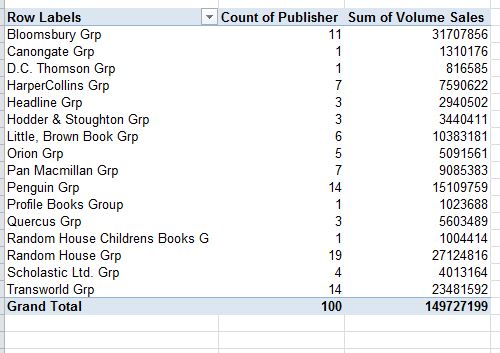 We see 2004 and 2005 accounting for 24% of all titles, at least suggesting that a sustained stretch of book availability need be paved before a book acquires the legs to command top-100 status (note that all three of the 2012 entrants issue from the excitable hand of E.L. James). But we’re not finished yet. It occurred to me that one could correlate a book’s sales with its interval of availability, namely the number of days having elapsed between its date of publication and August 9, the date in which the Guardian report beached up onto its Datablog. One could reasonably surmise that, all other things being equal, the longer a book’s availability the greater its sales (beholden of course to the understanding that our data are severely skewed – comprising the universe of best-sellers). 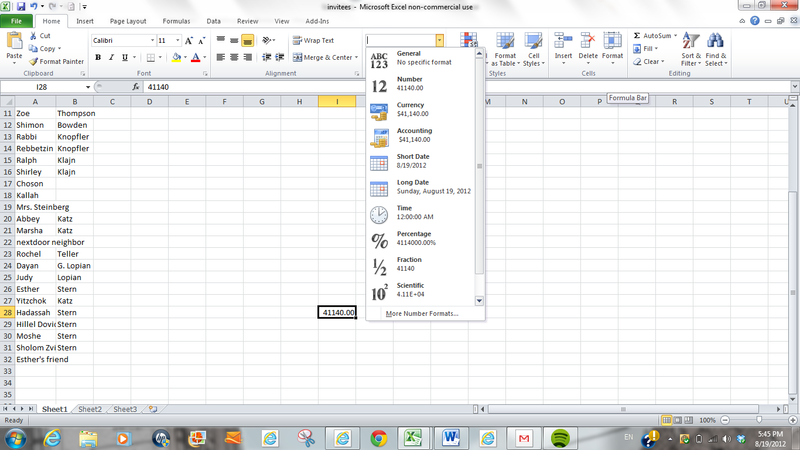 Verification of my little conjecture requires that we fashion a days-elapsed calculation, which draws us in turn into a slightly more searching look at how spreadsheets regard dates. Now back to the correlation question. If we want to associate book sales with their durability – that is, their extent of availability across time – we want then to correlate the data in Publication Date with those in Volume Sales, something we can do pretty easily with the CORREL function. Before actually going ahead, I’ll reiterate my hypothesis: that sales should be inversely correlated with publication date. In operational terms that means that the earlier the date – i.e., the smaller the date value (as per the above discussion) – the larger the volume sales. CORREL asks you to enter two ranges (here called arrays, but we’ll look past that technicality here. The ranges can be entered in either order) of identical lengths, whereupon it compares each pair of same-row values (e.g., H2 with D2, H3 with D3, etc.) and synthesizes the correlation. The higher the correlation in either direction, negative or positive, the greater the association between the values in the columns (though none of this would demonstrate causal association). Recall that I’m predicting a negative correlation here – earlier (smaller) dates, higher sales. Again, bear in mind that the ornate formatting imposed upon the Publication Dates doesn’t matter because the dates really are numbers, and will be treated as such. And that, my friends, is a decisively low correlation, avowing a minimal association between publication date and sales; and for many analytical purposes a correlation in the .078 range would end the tale then and there. No correlation, no story. But here, given a pairing of variables that could have reasonably been supposed to augur a significant association as a kind of null hypothesis, I would submit that absence of association qualifies as a bit of a pause-giver. Why shouldn’t older titles – older best-sellers – line up with more voluminous sales? Good question, I think. In any case, what we could really use here are week-by-week sales data, the sort that would empower us to build trajectories and sight trends, the better to bulk up the analysis. Doubtless Nielsen has such data, and just as doubtless they’ll ask you for big bucks in order to get it. So whaddya say we all chip in? You can put me down for a tenner; and maybe we can get J.K. Rowling and E.L. James to drop a few pounds in the kitty, too.